Notwithstanding the huge growth of Alphington, there are still interesting walks around the village and further afield. If you would like to join a local walking group, one of these meets on Thursday mornings at the SPAR shop on Ide lane at 10am. The walks are generally not more than 6 miles, with a stop for tea or coffee. 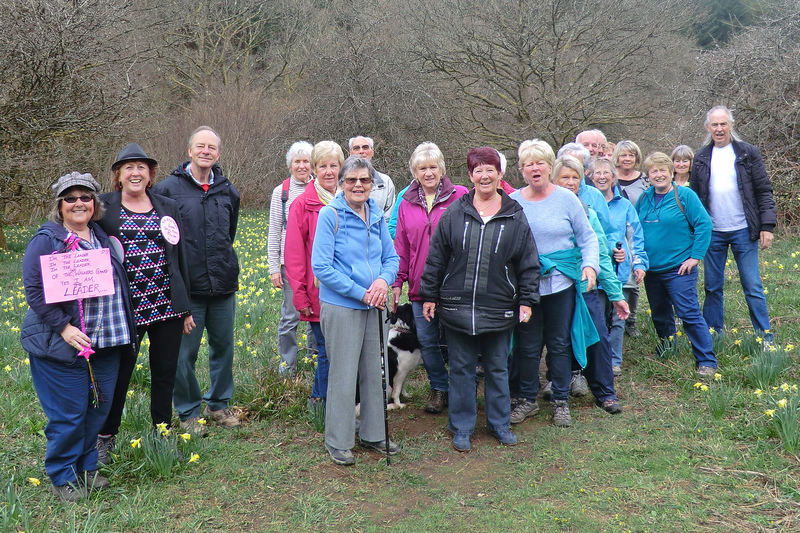 Occasionally the group goes further afield-here is a group photo taken at Dunsford Wood on 14th April 2016. The group now has a web page/blog at https://alphingtonwalks.wordpress.com/ where you will find many more photographs and route maps. Walk 1. To IDE. Ide Lane to Alphington spur road, cross road to green circle track along fields, continue to Twisted Oak pub, then cross footbridge to Ide or follow Doctors Walk road to main Ide bypass, turn left then cut right before the main entry road to IDE. refreshment available at the Huntsman. Walk2 to IDE. Up Shillingford Road to Markham lane, along Markham lane until either Polehouse lane or continue to T junction with main road. Turn right to get to IDE. Walk3 IDE to IDE. Leave IDE by the track following the stream and proceed up along the ridge until you meet the Longdown Road. Just before Longdown Road turn left down steep hill, past West town farm, and enter IDE via footpath behind church. Walk 4 to Shillingford Wood. walk towards Shillingford Abbott, then follow Barton Lane to just beyond Shillingford Organics, turn left along farm track, over hill to Shillingford St George, cross road and follow track in field first down hill then up steep lane to the top of the woods. Turn left at top of hill and follow lane until sign for “woodland walk”. Follow this path back through the bluebells (if you are lucky) to the steep lane you came up, then return to Shillingford St George to Alphington. No refreshment on this route except certain days at the Shillingford St G village hall. Walk 5 To IDE. follow walk 4 to Shillingford organics then turn right along track up to Markham Lane. Either go straight on on Polehouse lane or turn left along Markham Lane then right into Ide. Walk 5 to Pearce’s Hill. Walk up Chudleigh Road to the T junction, cross the A379 carefully and go up a few steps into the field. Cross the field and carry on towards Pearce’s hill. You can cut down to A379 near Devon Hotel via Trood lane or you can carry on up to near the top of the hill then down a lane to Devon Hotel. return to Alphington via Marsh Barton. Walk 6 to Little Silver. walk up Chudleigh Road to the T junction, turn right and walk along to the Little Silver lane just before Frank Tucker’s garage. once you get to Little Silver, cross the A30 by a pedestrian bridge, then you can follow the lane down to Devon Hotel.